An impressive business gift for clients or an executive gift that truly stands out! 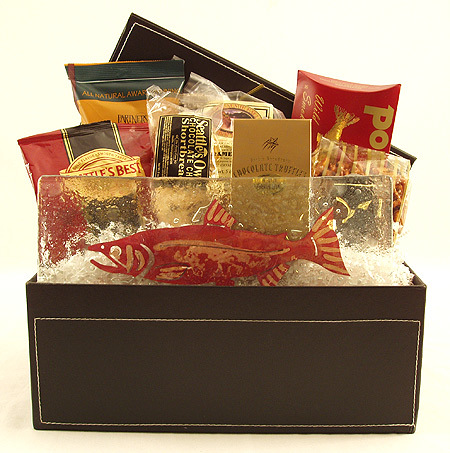 This Pacific Northwest Gift Basket features a beautiful handmade 5-inch x12-inch Fused Glass and Copper Salmon Plate inspired by the waters of the Pacific Northwest. Handcrafted by Jones Glassworks of Seattle, this Northwest art piece with its rich, warm copper colors stands alone as a stunning accent for home or office or it can be used for entertaining as an Appetizer/Sushi Plate, food safe, best hand washed and not recommended for use in the microwave. Features regional gourmet foods including Portlock's Smoked Salmon Fillet, Partner's Crackers, Seattle Sinsations Buttery Pretzels, Snoqualmie Candy Co. Caramel Corn, Seattle's Best Coffee, Seattle Chocolate's Truffles, and Seattle's Own Shortbread. Artfully arranged in a black home decor storage box, this package makes an elegant thank you gift for business clients, a perfect relocation gift, executive gift, housewarming gift, wedding gift, Happy Birthday gift for a man and Happy Birthday gift for a woman.